This listing is for a one (1) caster with a rubber expanding stem designed to fit 1 5/8" (OD) tubing. All casters have a locking mechanism (wheel is 3"). This caster contains a smooth, quiet roll and is ideal for work tables, shops or equipment that needs to be mobile with a 1-1/2" (ID) leg tubing. Polyurethane wheel rolls and swivels smooth and quiet with a single ball bearing and dust caps, these wheels are made with a non-marking and chemical resistant polyurethane and capable of holding 250lbs Per caster. 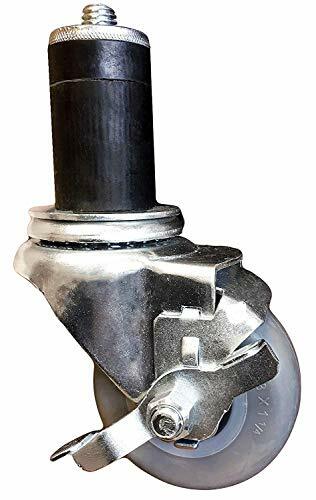 Very easy to install by tightening the top nural nut/ring to further expand the rubber adapter for a snug fit, inserting the caster and then by turning the bolt located under the swivel assembly once inserted for a tighter fit. 3" Commercial Kitchen Prep Table Caster. Non-marking and highly resistant to chemicals, grease, oil, solvents, and acid.